Previously dips had only lasted for a few hours, or up to a day maximum. The current pullback is now on its 4th day and Bitcoin is exhibiting the first real signs of distribution (aggressive and steady selling) we have seen in months. 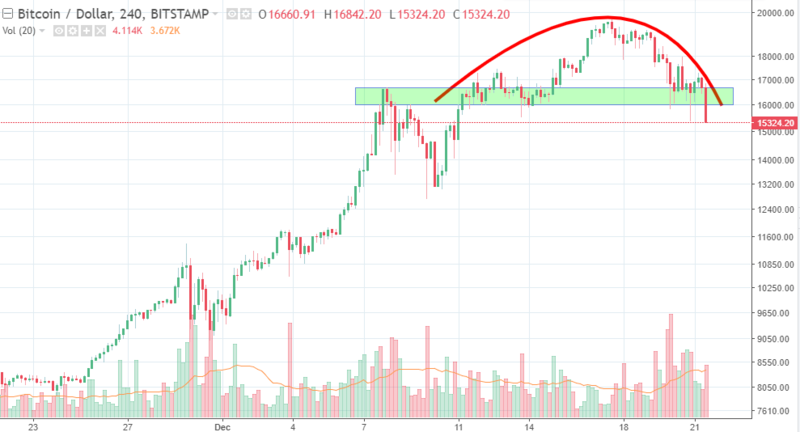 The $16,000 support level has been breached and the next major area of support is near $13,000. One of the factors which has supported Bitcoin's recent ascent has been the strong and steady price gains which have served to encourage new participants to jump aboard the cryptocurrency bandwagon. It will be interesting to see what happens when Bitcoin's price has been moving in reverse for a week or more, will the new crypto-converts continue to pour money into the space or will they begin to lose confidence?